SEO helps with ranking your website higher in the search engines. However, your content is the ultimate decider and your visitors are the controllers. If the content in your website fails to interest your readers then you have little hope of ranking well. Leaving your website is as simple as one click of a mouse. Therefore, content is the one element that decides whether your website is a success or a failure. No matter how effective your keywords are, how many links you have or how much you pay for traffic, if the content is unappealing to the readers it defeats the purpose of all the work and time you spend. Your website is the reflection of your services and capabilities. Don’t worry though, this has long been the common area of blunders for many so called SEO professionals too. Always remember the content you are writing will represent you and your business. More importantly, your content should not seem to be stilted and stiff. When you write for a specific topic, make a draft first or an outline. Do not be pressured by external factors such as keyword density and other technicalities. In fact don’t give them any attention at all! Instead, focus on making a draft. It will be much easier to integrate SEO strategies and techniques in the content later if at all. 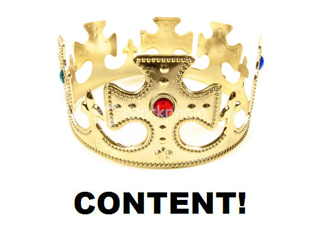 The content is easily the most important element of all even when considering SEO. Do not try to trick search engines by posting some interesting stuff and topics which are not related to the main content. Some writers purposely do this and mislead people. This creates a risk of losing trust rank, what’s worse is that you may end up being penalized. Avoid this practice. Always write content which is relevant to your audience. Keywords help drive more traffic to the site. Yes, this is true but people tend to place too much emphasis on keyword density. Your website will rank much better in the search engine results pages if all the content is written in a fluid and informative manner. Don’t get hung up on keyword density – it’s a waste of time. You may write conclusions or a brief summary of your content with the exact keywords at the first part of your article. As much as possible, let your keyword be present in your title or in the first line of the content. Remember too that excessive use of keywords in your content might end up earning a classification of spam, so try to avoid this. You can use synonyms and other terms in the next paragraphs to avoid redundancy. Most importantly, write freely about the subject matter and then return to see if you can add anything in a sensible and legible fashion. Lists help your content be easy to read and help make your content more comprehensive. It’s much easier for you to write content and use keywords moderately without them becoming redundant. Integrate links in your content. Avoid using phrases like “click here” when going to an external page or website. Instead, make use of your keywords or phrase. It is also much better if you use them as if they are really part of the content. Aside from the technicalities in SEO, writing will always be better if you apply all the rules in spelling and grammar. Don’t ever forget to proofread your work, this is sometimes forgotten and will affect the quality of your workfrom the reader’s perspective. Proofread and double check your work because readers will most often judge your worth by the content you provide. Belive me, readers are often easily turned off when they see mistakes. Always remember not to sacrifice the quality of your content. Look, you won’t always get it 100% right but you’ll achieve more and get better results if you try to do it right!